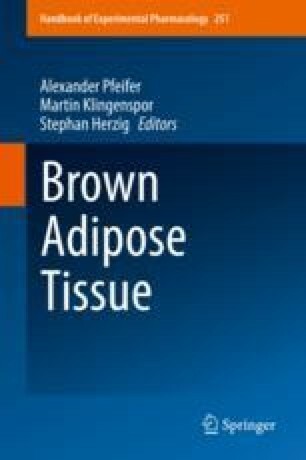 The present review reports on the current knowledge and recent findings in magnetic resonance imaging (MRI) and spectroscopy (MRS) of brown adipose tissue (BAT). The work summarizes the features and mechanisms that allow MRI to differentiate BAT from white adipose tissue (WAT) by making use of their distinct morphological appearance and the functional characteristics of BAT. MR is a versatile imaging modality with multiple contrast mechanisms as potential candidates in the study of BAT, targeting properties of 1H, 13C, or 129Xe nuclei. Techniques for assessing BAT morphometry based on fat fraction and markers of BAT microstructure, including intermolecular quantum coherence and diffusion imaging, are first described. Techniques for assessing BAT function based on the measurement of BAT metabolic activity, perfusion, oxygenation, and temperature are then presented. The application of the above methods in studies of BAT in animals and humans is described, and future directions in MR study of BAT are finally discussed. The present work was supported by the European Research Council (grant agreement No 677661, ProFatMRI), the German Research Foundation (DFG-SFB824/A9), and Philips Healthcare.